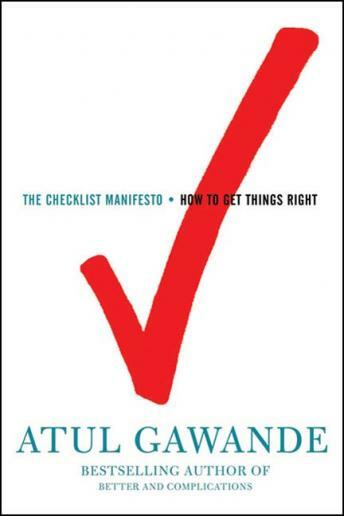 Listen to "The Checklist Manifesto: How to Get Things Right" on your iOS and Android device. We live in a world of great and increasing complexity, where even the most expert professionals struggle to master the tasks they face. Longer training, ever more advanced technologiesÄîneither seems to prevent grievous errors. But in a hopeful turn, acclaimed surgeon and writer Atul Gawande finds a remedy in the humblest and simplest of techniques: the checklist. First introduced decades ago by the U.S. Air Force, checklists have enabled pilots to fly aircraft of mind-boggling sophistication. Now innovative checklists are being adopted in hospitals around the world, helping doctors and nurses respond to everything from flu epidemics to avalanches. Even in the immensely complex world of surgery, a simple ninety-second variant has cut the rate of fatalities by more than a third. In riveting stories, Gawande takes us from Austria, where an emergency checklist saved a drowning victim who had spent half an hour underwater, to Michigan, where a cleanliness checklist in intensive care units virtually eliminated a type of deadly hospi-tal infection. He explains how checklists actually work to prompt striking and immediate improvements. And he follows the checklist revolution into fields well beyond medicine, from homeland security to investment banking, skyscraper construction, and businesses of all kinds.